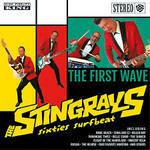 Mit ihrem traditionellen 60's Surf sind die Stingrays seit vielen Jahren eine feste Grösse, nicht nur am Berliner Surfhimmel. Wir sind sehr Stolz den ersten Longplayer dieser außergewöhnlichen Surfcombo präsentieren zu dürfen! Purer 62' Vintage Sound, exellentes Songwriting, extrem tanzbar. Die Scheibe macht Spaß und lässt diesen Sommer niemals enden. Hang Ten! Review von Alan Taylor Pipeline Magazin #99: ...just occasionally you come across an album that grows and grows on you. You play it over and over and it grows more and more. The Stingrays have done that to me with The First Wave and, after 27 years of reviewing, it's something of a relief to know it can still happen. This one's a cracker!!!! !